The Doctor is In! Making House Calls Count! 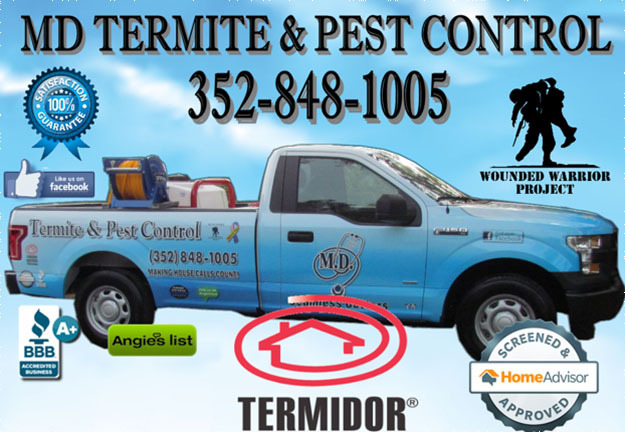 MD Termite & Pest Control started more than 40 years ago and is still family-owned and operated today. Many of our pest control & termite customers have referred us to their friends and neighbors. We take referrals very seriously and appreciate the word of mouth advertising our happy customers do for us. Our professional technicians are trained to uphold our high standards on every job we do, our experience enables us to handle residential and commercial work of any size and scope. Look for our excellent reviews on Angie's List, Facebook, Home advisor and the Better Business Bureau websites. We are also proud to be part of the Wounded Warrior Project. Why call us? Well we start off with the best customer service you can get anywhere. We come to you when you need us, most service calls within 24 hours! Service with a smile! Our skilled technicians are trained to deal with any pest issues you might have. The part is you get all us this for a very competitive price. We can beat almost any price. We service from Ocala to Apollo Beach. Our sister company is a seamless gutter company. We offer services from pest, termite, and lawn care to seamless gutters. Your satisfaction is guaranteed!